With it’s pink and purple colours the W24 compo 1 is marketed at female players, this review will give you the best information on the W24 compo 1 so you can make a decision on whether the hockey stick is going to be useful for your game. adidas’s W24 range is a great set of sticks in it’s own right. With the sleek black finish intersected with pink and purple and including the legendary triple stripe on the front and back you could very easily review this stick for men as well as women. Probably the best addition to the adidas hockey stick range in 2015 to review is the addition of the strength enhancing dual rod system in the compo 1 sticks. This feature adds carbon rods inside the shaft of the adidas W24 Compo 1 which adds significant hitting power throughout the head and lower part of the shaft. Across all the Compo 1 hockey sticks I’ve reviewed you can really tell the difference in how hard it hits the ball in comparison to other sticks of similar material compositions, particularly in slap hits and passes where you rely on the top of the head and bottom of the shaft. 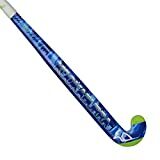 Extra power from the dual rod system is welcomed particularly in the extra light version of the W24 Compo 1, this stick is light, which is great for dribbling and keeping the ball under control. This years W24 Compo 1 is fitted with the XTREME24 shaft shape, 300mm up from the heel and 24mm curve this is certainly a midbow stick. However, with all adidas shapes the W24 Compo 1 isn’t a flowing mid-bow, this 24mm curve really takes a distinct kink at the apex which is great for aerial flicks. Another feature to review about the 2015 adidas W24 Compo 1 is the use of adidas’s touch compound technology. This abrasive layer on the face of the head really helps control the ball when dribbling, also it seems to stick the ball to the face quicker when receiving incoming passes, especially with a straighter stick. Combined with the touch compound the material composition of the adidas W24 compo 1 gives this hockey stick a great all-round feel for the ball. Full carbon can be pretty brutal and often unnecessary when you are receiving and dribbling the ball, not just outright smashing it. Because the make up of this stick is 70% carbon fibre you get a great balance of power and softness for the feel of the ball. The softness is also enhanced with the reinforced impact areas, this is achieved by adding aramid material to the face and the reverse edge. Overall my review of the W24 compo 1 is very positive, a great well balanced stick for any player looking to control the ball with a mid-bow shape stick. Really good levels of power, particularly for slap passes and a cool design for women and men. If you like adidas, get to grips with the full range by reading our ‘how to choose the best adidas hockey stick’ post created for the 2015 range.